While Mayor Kenney proposes a $2.5 million bump from last year, some of Council is suggesting close to a $25 million increase. The Free Library of Philadelphia testified in front of City Council this week to request funding for its 2020 fiscal year budget. In response to months of advocacy from the Friends of the Free Library, an independent, nonprofit organization whose objective includes bridging the community with the city’s system, the library system’s 2020 budget currently totals $45,760,383, which is $3,494,512 more than the Fiscal Year 2019’s estimated obligation levels. This figure, which is about $1 million more than Mayor Jim Kenney’s proposal of $2.5 million, would be allocated primarily toward providing six days of library service to every branch throughout the system during the school year. According to the current budget, Kenney’s proposed $2 million, along with $1 million from the library’s state funding, will be directed toward various Saturday hours from September through May. Approximately $500,000 in maintenance support will be dedicated to emergency repairs to prevent closures, according to the budget. For both the Friends of the Free Library and the Free Library of Philadelphia, six-day service is considered a top priority, as in September 2018, Saturday hours at nearly half of the city’s more than 50 branches were unexpectedly slashed due to staff constraints. Under the current 2020 budget, 45 more positions will be added to the system. Also, the number of proposed hours of service would jump about 15 percent from 106,800 in FY 2019 to 122,000 in FY 2020, which would not only add Saturday hours but will solidify weekday openings. However, the Friends of the Free Library demands either a $15.8 million increase for six-day service all year or a close to $14.7 million increase for six-day service during the school year only. The additional funds requested by the Friends of the Free Library include $7.1 million for materials, $2.5 million for property management, $645,000 for information technology, $237,901 for cultural and civic engagement, $182,461 for staff development, $105,559 for Culinary Literacy Center, $98,986 for customer engagement and $90,000 for youth and family services. For year-round, six-day service, some $4.8 million is requested to fund 67 full-time employees, 138 part-time employees and seasonal staff. For school year-only, six-day service, more than $3.6 million is being requested to fund 51 full-time employees, 138 part-time employees and seasonal staff. 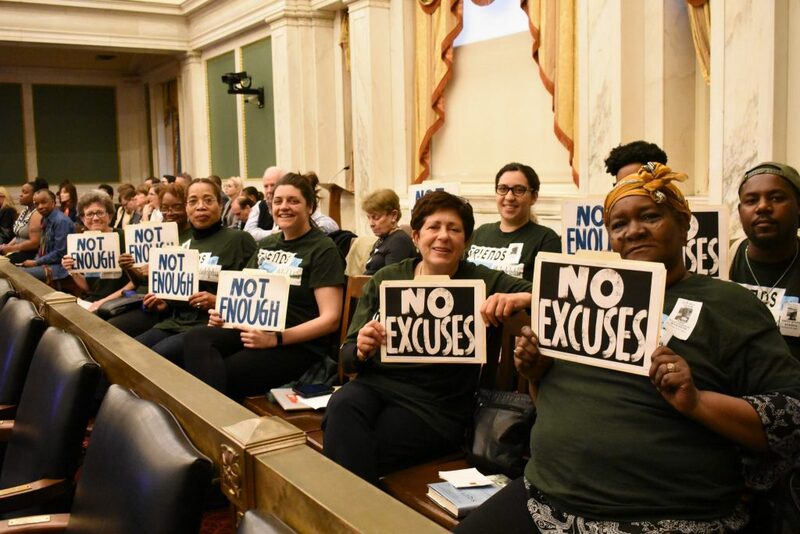 In early March, Councilman Kenyatta Johnson and a handful of Council members released a letter to Kenney stressing that $6 million in restored funds should be earmarked for staffing. “It seems like the library is the academic home for a lot of young people when school’s not in session,” said Councilwoman Helen Gym, who also advocated for increased summertime Saturday hours. While some Council members, such as Johnson, request a $6 million bump from last year, Councilwoman Cindy Bass is requesting approximately four times more than this figure, proposing a $25 million increase. Since the fall, both the Free Library of Philadelphia and the Friends of the Free Library attribute the lack of staffing to the closing. Reports from the Friends of the Free Library have revealed that in 2018 alone, neighborhood libraries reduced regular hours 375 times due to “staff shortage.” The organization also says that, throughout 2018, branches closed more than 750 times as a result of understaffing and building emergencies. According to the library administration, the average number of staffers should be seven, but several libraries, including some in South Philly, have reported only having four or sometimes even three present at a time. A minimum of four staff members are required to open library doors on any given day. If a fourth person is on the way, they can open up, but if they’re not there after two hours, then they must close, according to librarians. “It takes a village to ensure quality library service,” Reardon said. Members of Council questioned the reportedly increased frequency of absences taken by library employees over the past year. Reardon attributes the permanent and temporary leaves to a high frequency of illnesses and pregnancy. Along the lines of employment concerns, several Council members harped on what they view as, lack of diversity and inclusion among both executive and branch positions. They also brought attention to recent incidents of reported discrimination throughout the Free Library of Philadelphia. According to Reardon, 60 percent of branch managers are women. Approximately 35 percent of managers are minority races. Reardon says the library system’s 22-member board of directors includes 12 females, seven African-Americans, two Latinx members, and two Asain individuals. During the library’s professional development day in late April, a portion of the day will be devoted to the topic of diversity and inclusion, especially in light of recent racial incidents that were brought to the attention of the executive board by staff members, according to Reardon’s testimony. Bass says, in the event of these cases, stronger reprimanding needs to be performed by the executive staff.